Addicted to the wet fly grab and can't seem to get enough? Come shad with us! (May-June). 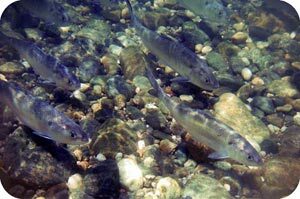 The American Shad is a high quality spirited quarry that is often referred to as "the poor man's tarpon or steelhead." Our shad outings are designed for all anglers and geared to help you and your friends to wade in, stretch a line and get hooked up with a smile. No better way to welcome the later Spring-Summer seasons than tightening up into multiple hook-ups with determined chrome slabs, averaging 2-6 lbs., maxing out the flex of your favorite rod. (Great learning curve and exposure to a variety of fly lines and strong emphasis and instruction of the single and double haul. Right up the alley and full throttle action for Spey casters!). High water years provide the added bonus opportunities of spring salmon, stripers and even summer steelhead catches. Most steelheaders are shadders and shadders are steelheaders---it's all about the grab!!! Shad outings are a great opportunity for multi groups of anglers and those yearning to learn fly fishing. Shad runs are brief and very popular. Advanced reservations a must. 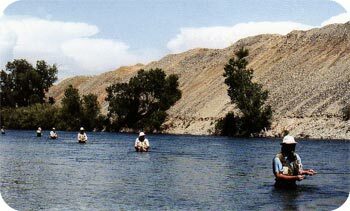 Trips are held either on the Yuba or Sacramento Rivers. Call (530) 623-6757 for current prices and dates available. Come have fun in the sun and experience the frenzy---Go Shad'en!